Mark Dawson, a PhD student at the University of Leeds, is set to undertake an important study of Fair trade activism by churches. Mark is part of the subject area of Theology and Religious Studies which has a long standing focus on understanding the role of religion in local communities. 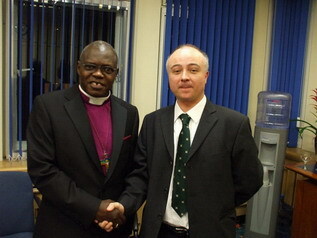 The study will focus on two Yorkshire communities and will look at how the churches in those areas connect with the wider public through their action in support of Fair Trade. Mark will interview churchgoers and listen to their opinions on how churches relate to their local communities in their work on Fair Trade, including their relationship to: the Fairtrade Towns movement, local businesses, politicians, community groups, other faith groups and the general public. The churchgoers will also be asked about how their work on Fair Trade relates to their own faith. The study will take three years to complete and will make a significant contribution to the body of research on Fair Trade activism. 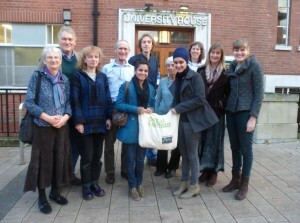 The University of Leeds is a Fairtrade University and the flagship employer for the Yorkshire Fairtrade Region. The Fairtrade Yorkshire Steering group committee congratulated award winners, Amarjit and Jas’ ,at their meeting at the University of Leeds on Saturday 9th November. Amarjit and Jas’ worship at the Sikh temple Guru Nanak Nishkam Sewak Jatha Leeds. The temple was presented with the ‘Best Outreach and Networking award’ by Fairtrade Foundation CEO, Michael Gidney, at the national Fairtrade Supporter Conference in London on 5th October. The award recognises the achievements and creativity of Fairtrade campaigners and supporters during the first half of 2013, including during the Fairtrade Fortnight campaign. As well as organising events for Fairtrade Fortnight, Fairtrade supporters at the temple also translated Fairtrade literature into Punjabi and wrote a document which links support of Fairtrade with insights from the Sikh faith. Well Done to St. Mary’s Menston for their efforts in working towards Fairtrade School status. The students have set up a campaign to make Fairtrade products more accessible locally and have worked with Leeds Development Education Centre to learn more about fair trade issues within school. “The challenge is to continue this work by educating our families, our neighbours and the wider community about this essential work” says teacher Jack Tunnecliffe. 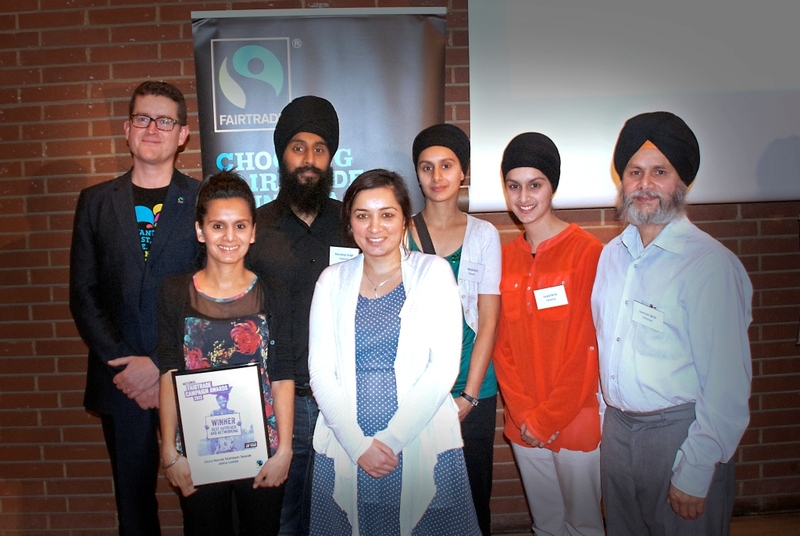 The Sikh temple Guru Nanak Nishkam Sewak Jatha Leeds was presented with the ‘Best Outreach and Networking award’ by Fairtrade Foundation CEO, Michael Gidney, at the national Fairtrade Supporter Conference in London on 5th October. The award recognises the achievements and creativity of Fairtrade campaigners and supporters during the first half of 2013, including the Fairtrade Fortnight campaign. 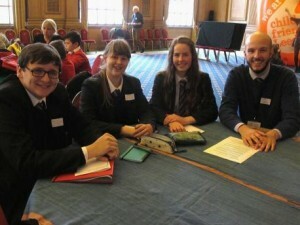 In Leeds, during Fairtrade Fortnight, members of GNNSJ-Leeds organised a number of events in which they showcased Fairtrade products and talked to the local community about Fairtrade. They created their own material to highlight the links between the Fairtrade ethos and the Sikh faith and were involved in events such as: a national football tournament, a local lifestyle event and a wide range of activities at the Gurdwara. ‘It’s a tough task picking winners from the vast amount of inspiring community action for Fairtrade across the UK. Each entry demonstrated the creativity, hard work and vision that epitomises the Fairtrade movement, and continues to bring about a better deal for more farmers and workers through selling their products as Fairtrade. 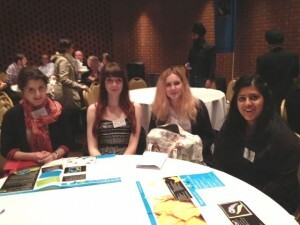 On the 5th of October, four students from Notre Dame Sixth Form College’s Fairtrade committee; Aneka, Rowanne, Katy and Hannah; travelled down to London to attend this year’s Fairtrade Supporters Conference. In the afternoon there were a series of breakout sessions where students attended events focussing on the important issues for Fairtrade campaigns like how to use social media effectively and the importance of engaging local businesses. The students all enjoyed the day and said that they had learned a lot about Fairtrade, in particular how it improves the lives of others and how to develop their own campaign within Notre Dame 6th Form College. All four students have returned keen to share their experiences with other members of the Fairtrade group and to ensure that they have the best campaign strategy possible.